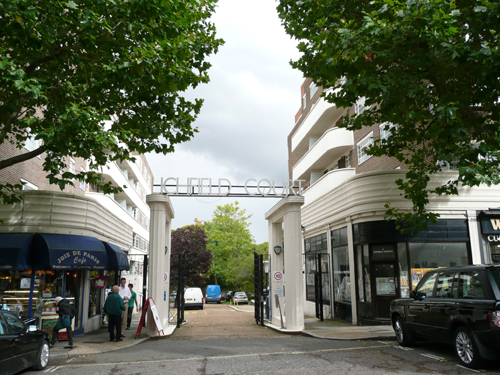 Lichfield Court is situated in Sheen Road, Richmond-upon-Thames. It is built on the site of Lichfield House which was believed by George Augustus Sala to have been built by Christopher Wren and later to have become the palace for the Bishop of Lichfield. It was designed by Bertram Carter and L.L. 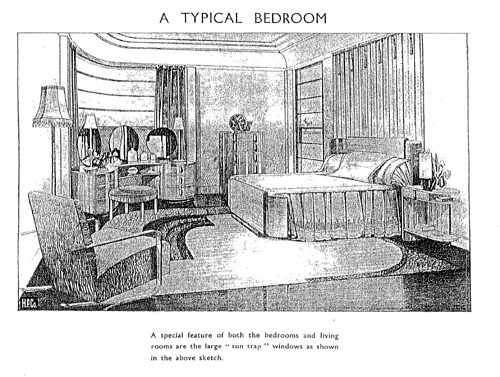 Sloot in fine Streamline Moderne style and built by Bovis Limited in 1935. The aim was to provide flats with a large floor area, big rooms and every possible labour-saving appliance at the lowest possible rental. The development consists of two blocks of flats, one large and one small, with a separate garage unit for 130 cars in the rear of the site. The main entrance is between the two blocks, which are fronted by shop premises, and gives access via large gates to a private road which continues down to the garage. The principal block is planned around an open court 200ft long and 65ft wide. 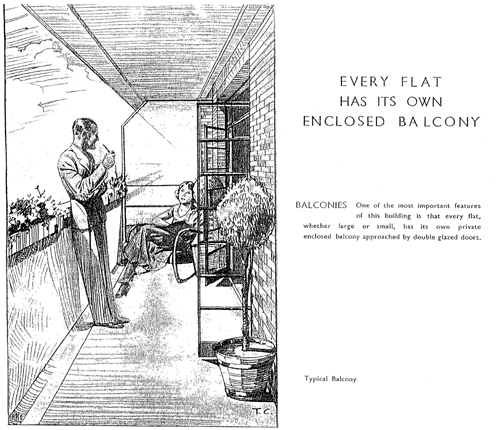 The approach to the individual flats is on the internal balcony system with covered stairwells (also containing passenger and service lifts) in each corner. The balcony, which is carried right round the four sides of the court, is five foot wide and has a solid balustrade. The service rooms i.e. bathrooms and kitchens are placed on the balcony side, thus acting as a buffer between balcony and principal rooms and ensuring the privacy of the flats. There are several different types of flats ranging from small ones with a reception room with bed-recess to larger ones with reception room with one, two or three bedrooms. 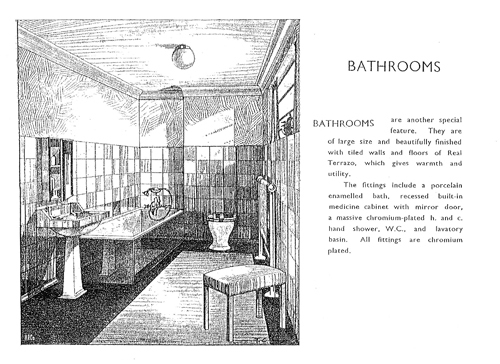 Each type also has a kitchen and bathroom. 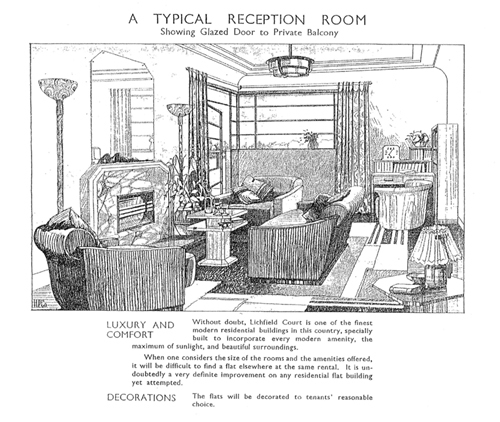 The original sales brochure stressed the modern conveniences such as constant hot water, central heating, passenger lifts, and three separate lifts for tradesmen and the delivery of furniture. One lift was large enough to take a “full-sized stretcher in case of illness.” ‘Electric refrigeration’ was another feature, and a water-softening plant and separate drinking supply was installed. 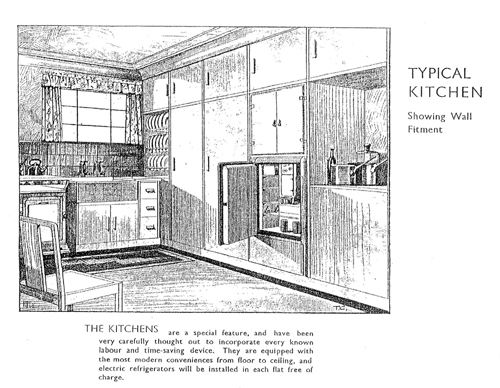 Both electricity and gas were installed so that tenants could have a choice for cooking. 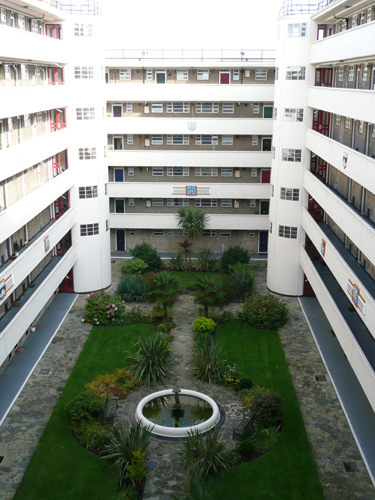 ‘Special arrangements’ were made so that tenants could have cheap electricity at ¾d per unit during the summer months and ½d per unit during the winter months. Other amenities were the ‘commodious cupboards’ in the flats and a large wardrobe in the bedroom, with a cloak cupboard in the entrance hall and a linen cupboard. There was also a general luggage room which was free to every tenant. In 1935 rentals were between £70 and £160 per annum. At that time the average annual salary was £200. 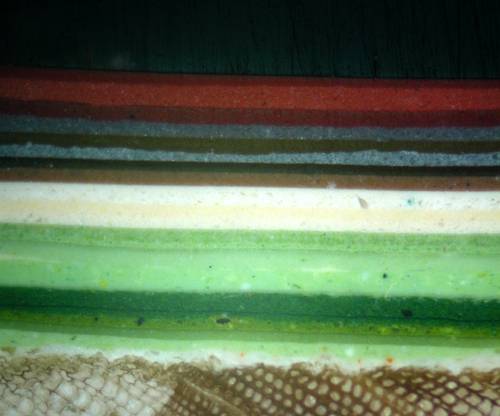 I was employed to identify the original colour applied to the doors to the stairwells. A very successful programme to replace the original windows has recently been carried out. Lovely piece of architecture and will never date,conveniently situated, but hidden in its own little world. It certainly is. I can see the attraction of living there. Great piece. I am moving into the building in 2 months. Where did you get hold of the original sales brochure? Thank you. They are great flats. I was lent a photocopy by the managing agents.